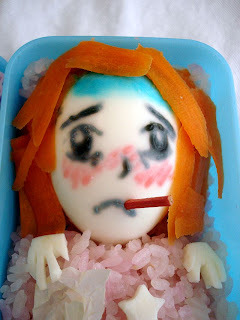 Bento art courtesy of Sakurako Kitsa. One of my sons was feeling puny. “I don’t think I should go to school,” he said. In between spoonfuls of cereal he took his temperature four times; the last one read 102-degrees. He thrust the digital display in my face and announced he had a fever. His response was five minutes of wailing — the last three from his bedroom — and then a return to the kitchen and a request that I take his temperature. I held the thermometer to his temple and after the requisite number of beeps it displayed 101-degrees. “I’m sick,” he said, beaming. The suggestion triggered more howls, but (with protest) he opened his mouth and I slipped the thermometer under his tongue. More waiting, more beeps and then a reading of 99.4. He screamed and stomped. I snapped lids and slammed cupboards. Ten minutes later I pulled up to school and he hopped out, face wiped free of tears. As he headed for the playground, he turned and blew me a kiss. I sent one back and hollered that if he felt crummy to go the nurse and she could take his temperature. That is hilarious! Seriously, I am over here laughing. This kiss just melts your heart, doesn’t it?